Recently the students in Ms. Whalen’s fifth grade class at Hinkle Creek Elementary School in Noblesville held a fundraiser for Paws & Think. 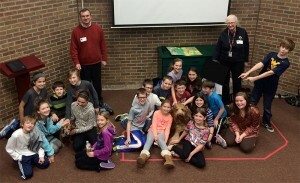 They were inspired to raise money for the organization after Paws & Think board members Brad Kupper and Kathy Janes and their canine partners Brewser and Mater came to their classroom to share information about the organization’s mission. Brad talked about Paws & Think’s Youth Canine Program, and Kathy educated the students about the training that is required for therapy animals. The class was very interested in the discussion that Brad and Kathy facilitated about the value of the human-animal bond and were amazed to learn that there is even scientific evidence to support the effectiveness of animal therapy. After learning more about how Paws & Think allows people and their pets to help others in need, Ms. Whalen and her fifth graders worked together to collect and donate over $500 to the organization! Our sincere thanks goes out to the students and Ms. Whalen for arranging the visit and fundraiser!